Steon Lighting have recently revived a popular luminaire that, until recently, was widely used and specified in the lighting market. The popular Churchill, Safepark and Unipack lighting ranges have been unavailable to the professional lighting market since the administration of Trac Lighting in 2013 however Nigel Walton, Managing Director of Steon, was eager to revive the fitting, which was renowned for being ultra-slim and durable. Steon offer a full lighting-design service in-house and where previous schemes have been over-hauled the Alley Pack has offered some very generous energy saving solutions with up to 85.7% energy save. If you would like more information on the Alley Pack please see our product page or contact us. 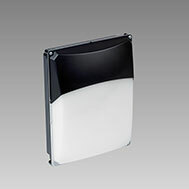 Steon Lighting have recently revived the popular Churchill luminaire, now named the ‘Alley Pack’.